Tax-loss harvesting is a process selling equities (stocks, ETFs and mutual funds) at a loss to get tax benefits. This might sound counterintuitive. Why would you sell at a loss? The idea is to sell the equity to realize a loss and then buy back the equity at reduced a price. Effectively, realize a loss without any change in portfolio. In a way this can be considered as an indirect income. Interested? For illustrating tax-loss harvesting we consider the fluctuations in VGTSX and VFWIX during the most tumultuous times i.e. 2008 great recession. 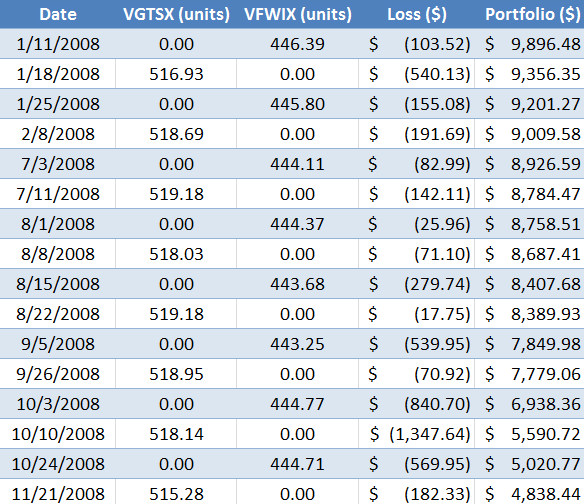 VGTSX started 2008 at $19.32 and ended at $10.68. A drop of 44.72%! In the same time frame VFWIX fell from $22.39 to $12.07. So, the effective drop was 46.09%. As I mentioned before VFWIX & VGTSX track pretty much the same set of stocks and hence their returns are more or less the same. There may be some minor differences due to index tracking errors. The data set I used looks at the weekly variation in prices throughout 2008. Now let’s say we invested $10,000.0 in VGTSX at the beginning of 2008. The value of our portfolio at the end of 2008 (12/26/2008) would be $5,527.95. This would of course be an unrealized loss and cannot be harvested. Total doom and gloom! Can we do something about it? Now, let’s apply tax-loss harvesting strategies. We again start with $10,000.0 invested in VGTSX. On 1/4/2008 was priced at $19.32. So, we would have 517.60 units of VGTSX. Now, we keep holding VGTSX until the price drops below $19.32. Fortunately, we don’t have to wait long enough. On 1/11/2008 the price dropped to $19.12. We immediately sell our position in VGTSX realize a loss and move our cash to VFWIX. The loss generated is ($103.52). Our new VFWIX position was at $22.17 and contains 446.39 units. Now we repeat the same process as above. We wait till VFWIX falls below $22.17. It happens right next week. On 1/18/2008 price of VFWIX dropped to $20.96. Again we sell our VFWIX position at a loss of $540.13 and invest our cash into VGTSX. What would have happened if we had not done the sale we did above? 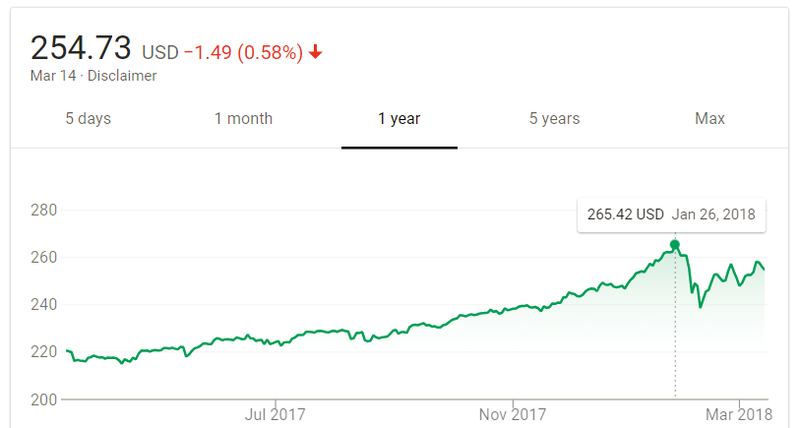 We would have started with a portfolio of $10,000 (in VGTSX) and ended up with a portfolio of $9,368.53 (VGTSX) and an unrealized loss of $631.47. Not much interesting. Now let’s consider our alternate scenario. We would have again started with a portfolio of $10,000 (in VGTSX) and ended with a portfolio of $9,356.35 (VGTSX). 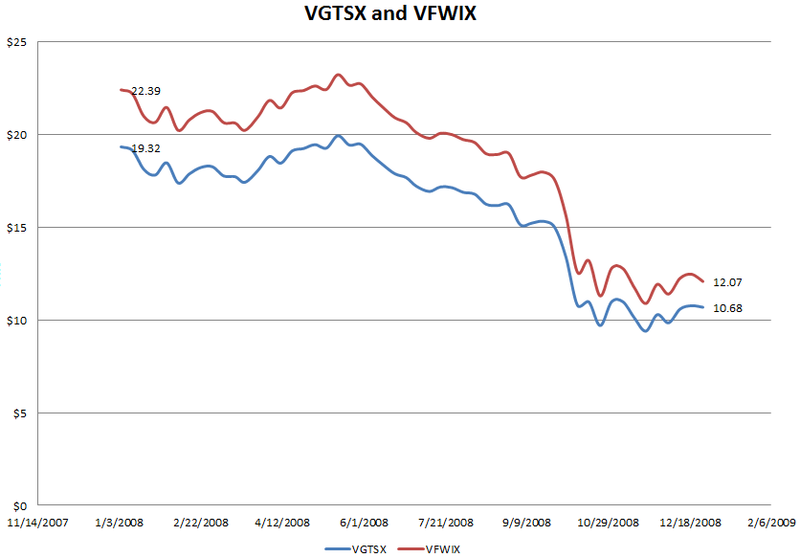 Remember we started with VGTSX switched to VFWIX and came back to VGTSX. Now we end up with $643.65 in unrealized loss. However, in addition to unrealized we also have realized losses! The realized loss is $643.65 ($540.13+$103.52). This loss is eligible for stock loss tax deduction. With a marginal tax rate of 25% that’s an additional $160.91 in effective savings (via reduced tax). Now let’s apply same tax-loss harvesting discussed above for the entire year (2008). The table below shows the results. Using tax-loss harvesting the total realized loss is $5,161.56. This loss can be used to reduce taxes on ordinary income. Again, using a 25% marginal tax rate the effective tax benefit is $1,290.39. 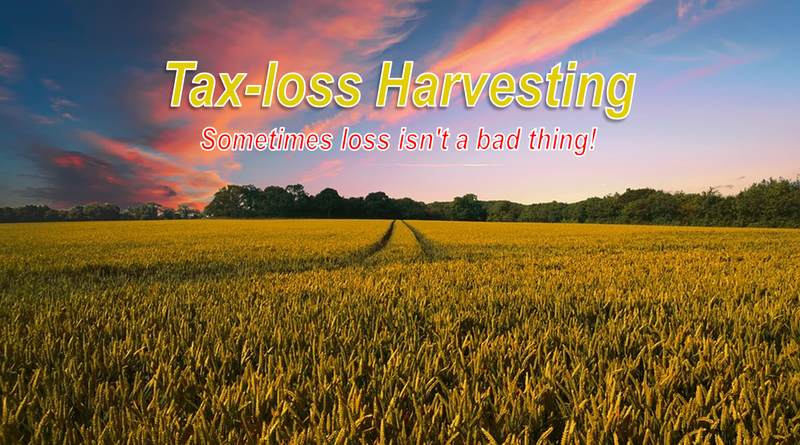 Unfortunately, the harvested losses are subjected to a tax deduction limit of $3,000.00 per year. So, we would have to report losses of $3,000.0 in one year and the rest ($2,161.56) is carried forward as tax-losses for the next year (indefinitely). This is of course assuming you had no other profits (i.e. capital gains). If you had additional capital gains of $6,161.56 (let’s say). Your final tax bill would be for 1,000.0$. Now there are no more tax-losses to carry forward. The tax deduction can be applied to both short-term capital gains and long-term capital gains. How about the portfolio value? We held 515.28 units of VGTSX on 11/21/2008. After that we have had no more opportunities to tax-loss harvest. So, at the end of the year (12/26/2008) the value of our portfolio would be $5,503.14. This is not much different from what it would have been if we had not done any tax-loss harvesting i.e. $5,527.95. There is the additional transaction fee associated with each transaction. Certain brokerages like Robinhood have zero-transaction fee. Here is another example where we use VFINX and VTSMX. VFINX is the S&P 500 index fund and VTSMX is the Total Stock Market index fund. Again, let’s say we had $10,000.0 worth of VFINX on 1/4/2008. By the end of the year it would be down 38.26% (an unrealized loss of $3,825.61). Now let’s look at the tax-loss harvesting strategy results. We would have an overall realized loss of $4,339.65. Considering a 25% marginal tax rate it would generate $1,084.91 reduction in tax bill. How about the portfolio itself? 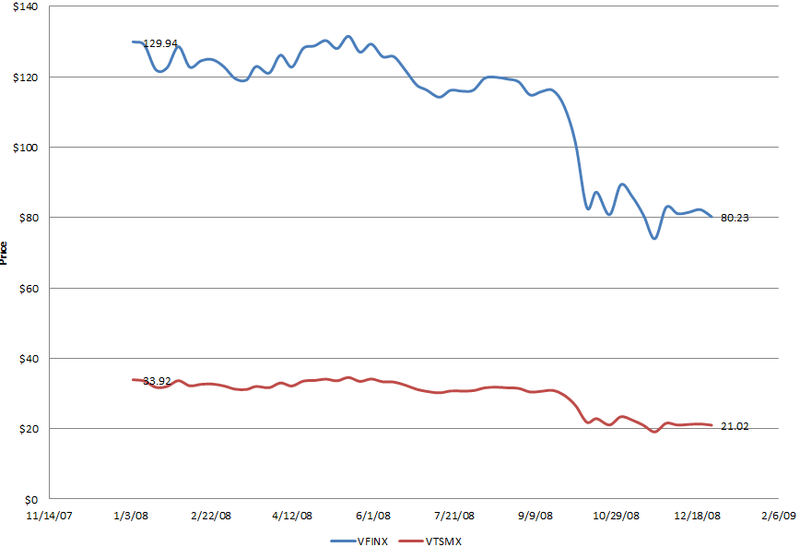 On 11/21/2008 we hold 296.20 units of VTSMX after which we have not had a chance to realize a loss. So, the value of our portfolio on 12/26/08 would be $6,226.09. In comparison if we had held on to VFINX i.e. without tax-loss harvesting our final portfolio would have been worth $6,174.39. The above illustration is very interesting because we used two mutual funds which are very different. VFINX is a large-cap fund. VTSMX on the other hand has exposure to large-cap, medium-cap and small-cap stocks. 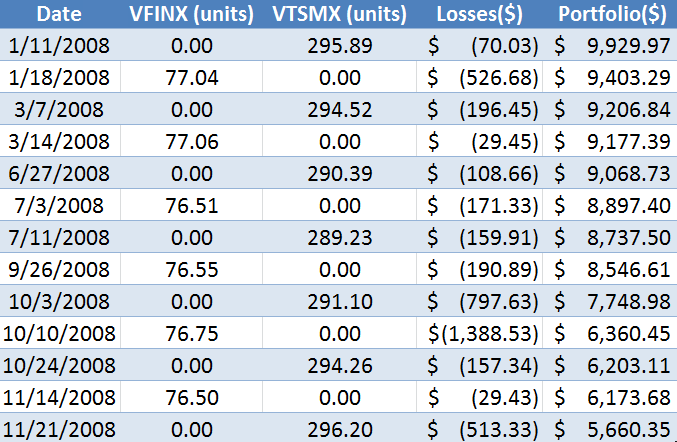 However, VFINX makes 81% of VTSMX i.e. 81% of the total market capitalization is from the top 500 companies. So, does IRS provide us free money? Not really. It’s not possible to sell a security at loss and then buy it back within 30 days. For e.g. you cannot sell XOM at a loss today and buy it back tomorrow and use the loss for tax-loss harvesting. This is considered a wash-sale. IRS wash-sale rule prohibits you from deducting such losses. The key point in identifying a wash sale is “substantially identical securities”. With XOM sell and buy there is no ambiguity i.e. they are exactly the same. But, between VGTSX and VFWIX IRS might not consider them to be substantially identical securities. It is very important to ascertain that the securities involved are substantially different. This is a gray area. Tread carefully. What about a bull market? In the last year VFINX has been on fire. The first opportunity to initiate a tax-loss harvesting strategy was on Jan 26, 2018. Even though the opportunities are limited it is possible to exploit tax-loss harvesting in a bull market. 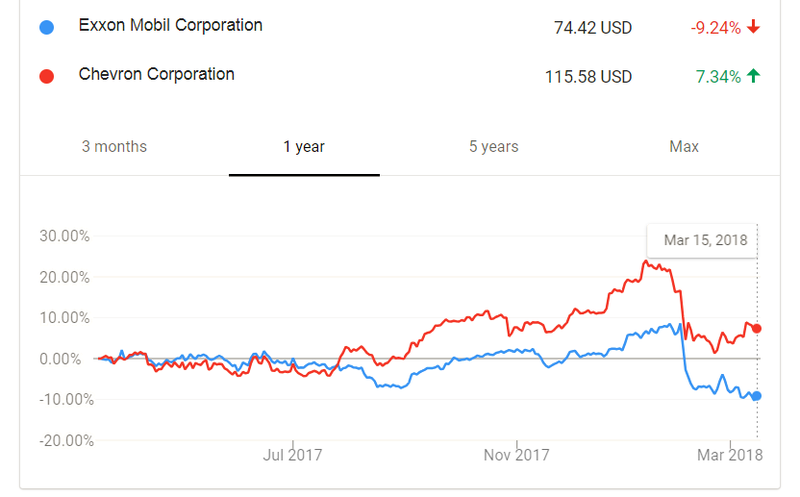 Going back to the example of Exxon Mobil (XOM), could we couple Exxon with Chevron (CVX) for a successful tax-loss harvesting strategy? The answer would be yes. Since they are in the same industry they would definitely be impacted by similar macroeconomic trends i.e. a drop in oil price would cause both their prices to drop. However, there are other company specific factors that might impact stock prices e.g. management. Hence, I would typically avoid individual stocks as they fail substantially identical securities test. That being said you could always wait for 30 days and buy back XOM. But, if in the 30 days the price of XOM goes up this strategy might fail as we might not be able get as many shares we had before. My strategy is always to sell and buy a similar security immediately. Tax-loss harvesting in an IRA or any other tax-advantaged account is meaningless as these accounts are not subjected to taxes on capital gains. Tax-loss harvesting techniques are most tax efficient in taxable accounts with mutual funds or ETFs. Financial advisors like Wealthfront or Betterment have (daily) automated tax-loss harvesting strategies built in. Because Betterment or Wealthfront are not aware of your other investment accounts they might execute orders which could lead to wash-sale instead of tax-loss. This might happen because you executed a substantially similar order in one of your brokerage account. I believe there is an option to opt out. Disclaimer: Tax-loss harvesting is not for everyone. You should not make any decision, financial, investments, trading or otherwise, based on any of the information presented on this blog without undertaking independent due diligence and consultation with a tax advisor or competent financial expert. You understand that you are using any and all information available on or through this blog at your own risk. Thanks Tom. Definitely better than nothing. I am planning to hold on to GE for now. I generally keep swapping funds to generate tax-losses. Nice summary and good advise DG. Thanks for the summary DG, lots of good information here. I'm not going to lie, I read through this and it sounds like a complicated strategy. I'm sure it's a viable strategy, but it seems a little advanced for beginners. I could be wrong, but that's my two cents. Its not very complicated. It does require constant trading to exploit every opportunity. It is time intensive. Services like wealthfront and betterment offer this for free. I'm not a big tax lost harvester but do keep it in mind before year end. Thanks for sharing your explanation of tax lost harvesting. You're welcome GYM. I tax-loss harvest throughout the year. Not sure it still applies with the new tax plan but be careful of the wash rule when using this strategy. Thanks Charlie. Like I mentioned wash-rule applies only if you sell and buy substantially similar assets. I typically don't do that.